Home » wireless » Do Cell Phones Pose a Health Hazard? Do Cell Phone Companies Know About Them? Do Cell Phones Pose a Health Hazard? Do Cell Phone Companies Know About Them? With all the recent news about increased glucose metabolism in the area of the brain in proximity to cell phone antennas (study abstract here), I thought it worth re-printing this blog article I wrote back in November 2010 regarding the possibility that cell phone makers may know more about health risks associated with cell phone use than they may be letting on. There's another blog article I wrote regarding what studies ARE already out there regarding risk of developing brain tumors that I felt worth re-printing below as well. It is true that some people may find this recent research good news for some young people as it may be the only stimulation their brain gets (joking! ), but it does bring some additional concerns that may merit limiting cell phone use as well as how it is used. Recently, there has been much speculation on whether cell phones pose a health risk. What I find interesting is that the cell phone makers may actually know more about these risks than they are letting on or even have evidence for them. If you look in the small print booklet that comes with your cell phone, cell phone makers state that phones should not be in contact with your body or skin and should be kept a certain distance away when in use or when carrying around. The picture of how the Verizon ad guy is using the cell phone is exactly how you are NOT supposed to use the cell phone (cell phone pressed against the face). "When using iPhone near your body for voice calls or for wireless data transmission over a cellular network, keep iPhone at least 15 mm (5/8 inch) away from the body, and only use carrying cases, belt clips, or holders that do not have metal parts and that maintain at least 15 mm (5/8 inch) separation between iPhone and the body." 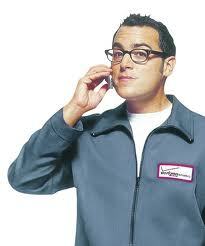 Now, when I use a phone and answer a call, I have the phone right up against my ear just like the Verizon ad guy. I do not keep it 5/8 inch away from my ear/head. Now why would a cell phone maker care whether the phone is right up against the ear (so you can hear better) or not unless there is some concern that there may be a danger due to proximity/contact? Perhaps they are protecting themselves from any possible lawsuit that may occur in the future due to health problems that will occur with phone use over time? Kind of reminds me of the tobacco industry who for years denied that smoking posed any health risk. Now we know better. It would be ironic if Paul Marcarelli, the actor of the "Verizon Guy" character, develops a brain tumor due to cell phone use and sues the wireless industry just like the family of David McLean, the actor of the "Malboro Man," sued the tobacco industry for wrongful death when he developed and died from lung cancer caused by smoking. So are there studies out there suggesting that cell phones and wireless phones can lead to brain tumors like astrocytoma, malignant gliomas, and benign acoustic neuromas? Several studies published since 2009 containing long-term (10+ years) follow-up have lent support that it does. Though unclear how exposure to a phone's microwave radiation leads to brain tumors, it is known that the cell signal is absorbed up to 2 inches into the adult skull. Even more worrisome is that the depth of penetration is even deeper in children. Symptoms that a patient may exhibit that may suggest a brain tumor are subtle and include hearing loss or ringing of the ear on the same side the phone is used on. It should be noted that all currently published results are based on retrospective studies and ideally, prospective studies will be required to provide more definitive results. However, that will take a long time and perseverance on both the researchers as well as the subjects since ideally, many of the study subjects should be children who are currently using cell phones (which it seems to be nearly all kids nowadays). In any case, to be on the safe side, it is recommended to talk on speakerphone or use a wired headset (not wireless), or avoid altogether if at all possible, especially in children. Even the CDC has had reservations regarding health risks due to cell phone use. Effects of cell phone radiofrequency signal exposure on brain glucose metabolism. JAMA. 2011 Feb 23;305(8):808-13. I think mass usage of cell phones may hurt your health. We should use cell phones as a communication source rather making a habit of sticking it to our ears. It produces radio active waves continuously so don't let it hurt your health. Use it just as a helping hand in communicating others. Great tips. I am quite confused to WHO's response to this issue. I just try to minimize exposure to them. Besides, with how advanced our technology today, I do not believe we can completely eliminate being exposed to cellphone's radio frequencies.